Sterling silver Kiddush cup and plate set, complete with cut-out wording. 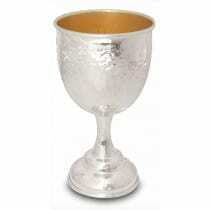 A simple and elegant silver Kiddush cup rests in the center of a grand silver base plate. The plate features wave-like curves and cut-out Hebrew lettering along the rim. The lettering spells out the blessing over wine which reflects off the cup, enhancing the design.